Laughter's ability to light up a room (or a household, classroom, playground, even a cocktail party) and enliven an atmosphere within seconds is magical. Parents and children will always be able to relate to the power of a laugh or a smile, so why don't we do it more often? • Laughing at yourself. As a parent it's important to show your kids that you can be silly too. Prove to your kids that grown-ups know how to have just as much fun as they do. Laughter is a human quality designed to allow us to let go of our seriousness for a moment or two and really smile. Make sure your child picks up on this energy. If you make a mistake or you do something funny, laugh at yourself so your kids learn how to overcome worry or cope with anxiety by engaging a more positive, carefree attitude. • Telling kid-friendly jokes. 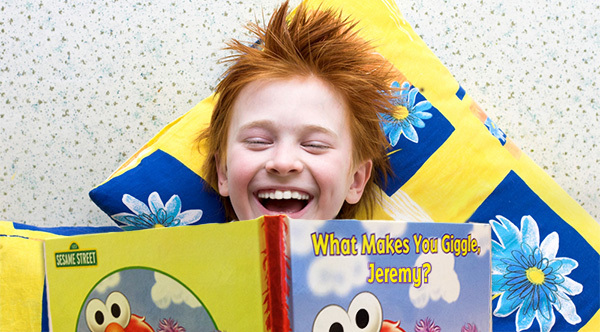 Telling jokes is a great way to stimulate a child's thinking process. And, chances are, if you tell them a good joke that really resonates with them, they'll be encouraged to retell the joke to their friends. This will teach your child how to remember a story, riddle, or phrase while challenging them to tell it in the correct chronological order. Your kids will be more confident to speak up in a group, will always feel they have something to say, and will learn how to relate that joke or story to other situations. • Including a daily joke in your child's lunchbox—write it on a piece of paper or a napkin and toss it in their lunch pail. If your child is having a hard day, they'll be able to look forward to the note you've written, and you might be able to give them a little giggle or smile with a silly fact or a funny joke. • Sharing funny happenings or out-of-the-ordinary occurrences with your child. When your child gets home from school, always ask him or her if anything funny happened at school that day—at lunch, recess, in the classroom, etc. Likewise, if something funny happened to you that day, share it with your child to see if you can get a chuckle out of him. • Being silly together. Have tickle fights, chase your children around the house or the yard, let it all go and just be goofy with each other. • Reading funny books that make you both laugh. Find out what kind of books, characters, or themes make your child laugh and seek those titles out to read together. It's always great to see a smile or hear a giggle when reading. For both children and parents, laughter encourages a more positive attitude, releases all kinds of emotions, and can help you and your children overcome some of the tough stuff life throws your way. Laughing and smiling are some of the greatest joys in life, and are even better when we experience them together. Having fun and laughing out loud together will inspire us to live freely, so let's do it more! Take some time out from busy schedules to play and laugh as a family, and you'll live with less stress and more happiness. Our Newest Personalized Sesame Street Book! What makes you giggle? What gives you a grin? Big Bird in a tutu doing a spin? For the first time available for personalization, What Makes You Giggle? is an original exploration into two of the most important aspects of life: what makes us happy and what makes us laugh.